New to Windows Admin Center? Learn more about Windows Admin Center or Download now. You can add individual servers running Windows Server 2012 or later to Windows Admin Center to manage the server with a comprehensive set of tools including Certificates, Devices, Events, Processes, Roles and Features, Updates, Virtual Machines and more. Click + Add under All Connections. Choose to add a Server Connection. Type the name of the server and, if prompted, the credentials to use. The server will be added to your connection list on the Overview page. Click it to connect to the server. You can also add failover clusters or hyper-converged clusters as a separate connection in Windows Admin Center. System Insights System Insights gives you increased insight into the functioning of your server. Overview allows you to see the current state of CPU, memory, and network performance, as well as perform operations and modify settings on a target computer or server. View BMC IP address with hyperlink (requires IPMI-compatible BMC). View feedback and proposed features for Server Overview. Active Directory is an early preview that is available on the extension feed. View feedback and proposed features for Active Directory. Backup allows you to protect your Windows server from corruptions, attacks or disasters by backing up your server directly to Microsoft Azure. Learn more about Azure Backup. Certificates allows you to manage certificate stores on a computer or server. View feedback and proposed features for Certificates. Containers allows you to view the containers on a Windows Server container host. In the case of a running Windows Server Core container, you can view the event logs and access the CLI of the container. View feedback and proposed features for Containers. Devices allows you to manage connected devices on a computer or server. View feedback and proposed features for Devices. DHCP allows you to manage connected devices on a computer or server. View feedback and proposed features for DHCP. DNS allows you to manage connected devices on a computer or server. Create PTR, CNAME type of DNS records under reverse lookup zone. Events allows you to manage event logs on a computer or server. View feedback and proposed features for Events. Files allows you to manage files and folders on a computer or server. View feedback and proposed features for Files. Firewall allows you to manage firewall settings and rules on a computer or server. View feedback and proposed features for Firewall. Installed Apps allows you to list and uninstall application that are installed. View feedback and proposed features for Installed Apps. Local Users and Groups allows you to manage security groups and users that exist locally on a computer or server. Network allows you to manage network devices and settings on a computer or server. PowerShell allows you to interact with a computer or server via a PowerShell session. Processes allows you to manage running processes on a computer or server. View feedback and proposed features for Processes. Registry allows you to manage registry keys and values on a computer or server. View feedback and proposed features for Registry. Remote Desktop allows you to interact with a computer or server via an interactive desktop session. View feedback and proposed features for Remote Desktop. Roles and Features allows you to manage roles and features on a server. View feedback and proposed features for Roles and Features. Scheduled Tasks allows you to manage scheduled tasks on a computer or server. View feedback and proposed features for Scheduled Tasks. Services allows you to manage services on a computer or server. View feedback and proposed features for Services. Settings is a central location to manage settings on a computer or server. Storage allows you to manage storage devices on a computer or server. Storage Migration Service requires Windows Server 2019. 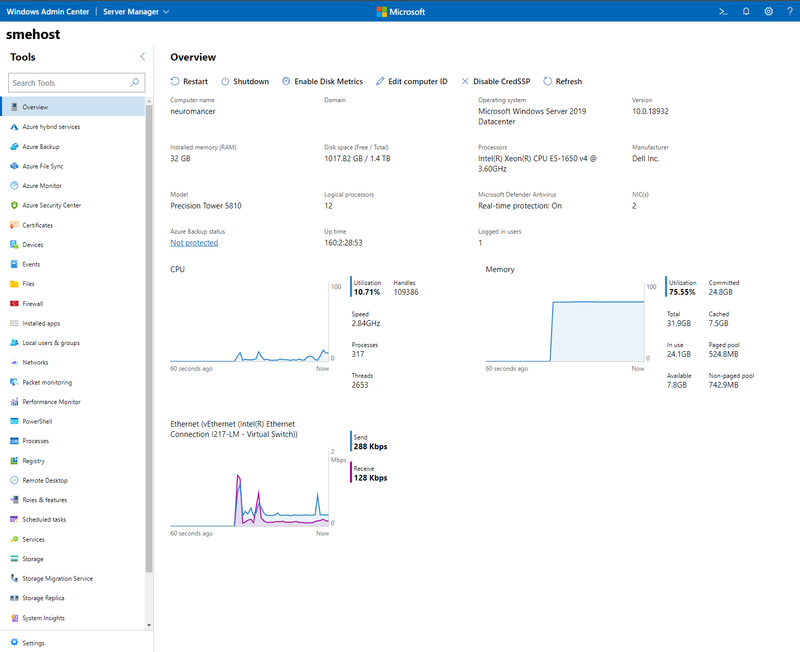 System Insights requires Windows Server 2019. Updates allows you to manage Microsoft and/or Windows Updates on a computer or server. Virtual Switches allows you to manage Hyper-V virtual switches on a computer or server.